On April 2013, Iron Man 3 appeared in Philippine theaters. There was a scene where Tony stark was in a room, wearing shielded sunglasses that caught my attention: 1 He actually wore two variants of it: a Silver/Cobalt frame with gradient lens & a Gold/Black frame with solid red lens. He also wore an entirely different model which I didn’t really care for. Either the internet didn’t have any info on it that night, or I was too stupid to consider searching (probably the latter) – but I finally identified the sunglasses in question two months after. It was a Matsuda M3023. Shortly after narrowing down the name and brand, it was fairly simple to find where I could actually buy it.. I then tried checking for any local suppliers (there were none at the time). Since the M3023 comes in two sizes, this posed quite a problem; because if I was going to drop $500 on a pair of sunglasses, I wanted see if they actually suited me in the first place, 2 I know for a fact that any Ray-Ban doesn’t look good on me – but Oakleys usually do and that also meant being able to try both sizes. There was a local hit on Sulit.ph for the larger sized version – and as luck would have it, the seller was actually kind enough to be willing to meet up so I could try them on without having to buy them – faith in humanity restored! My friends and I thought they looked pretty good – which sealed the deal; I was going to get one… the question remaining was which size – as I haven’t gotten to try the smaller variant. Fast forward 7 months to January 2014; a new optical store in SM Aura called Ronnie & Joe had just opened. 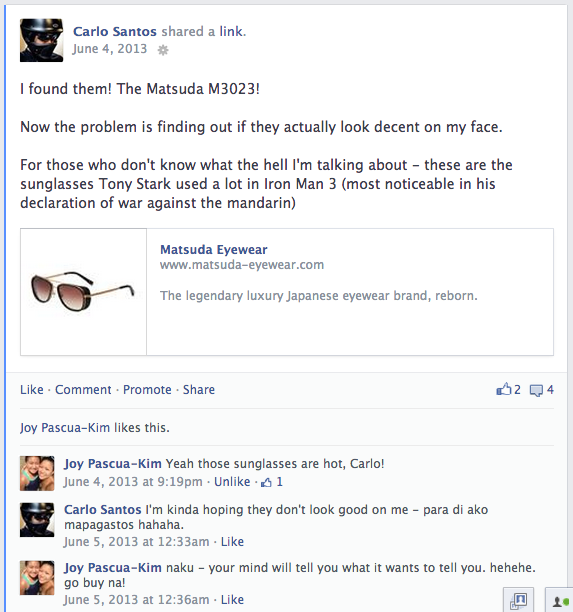 They’re [currently] the sole distributor of the Matsuda line in the Philippines. And thank god for that! I was able to visit the shop and confirm beyond any doubt that the smaller size indeed was a better fit! Unfortunately, that’s where my luck ended. The color way I wanted wasn’t included in the initial stock order. Not only that, but it was revealed that they had stopped producing the color way altogether – which meant it would never be restocked ever again anywhere. I had no choice but to get it at full price from the US. 5 It wasn’t really an issue – since I was ready to get it at that price to begin with. Of course, being pinoy, one can’t help the urge to squeeze as much value as you can out of a purchase. My consuelo de bobo (fool’s consolation) was knowing that not as many people around the world will get to own that particular color way. Lady Luck didn’t abandon me entirely though. The moment I decided to source it from the US, I learned that a friend’s uncle was visiting the next week. That very night, after confirming his address and willingness to bring it home, I placed the order – and a few days later, my seven month journey of acquiring the M3023 had come to a close. 1. 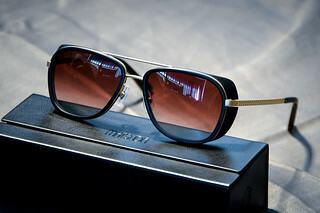 ⇡ He actually wore two variants of it: a Silver/Cobalt frame with gradient lens & a Gold/Black frame with solid red lens. He also wore an entirely different model which I didn’t really care for. 5. ⇡ It wasn’t really an issue – since I was ready to get it at that price to begin with. Of course, being pinoy, one can’t help the urge to squeeze as much value as you can out of a purchase.